Another painting in a series of nocturnal gouache (opaque watercolor) paintings that were inspired my my hikes in moonlight. By The Light Of The Moon was created by artist Frank S. Wilson in 2010. This art piece , which is part of the Gouache Paintings portfolio, is a Paintings artwork. The style of this artwork is best described as Fine Art, Impressionism, Realism. The genre portrayed in this piece of art is Landscape. 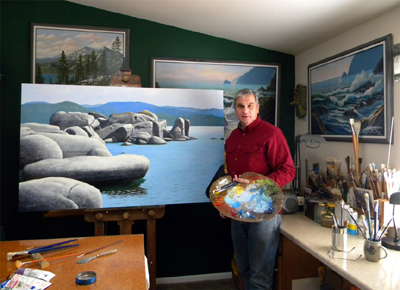 The artwork was created in Gouache. The size of the original art is 10 (inches) H x 14 (inches) W.
Words which artist Frank S. Wilson feels best describe this work of art are: landscape, frank wilson, gouache, realism, moonlight, meadows, trees, mountains, by the light of the moon, sierra nevada, sierras, sierra nevada mountains, hiking trail, path, path in the mountains, gouache painting, gouache paintings, romantic, nocturnal, nighttime, night, night landscape, .